What do the icons in Eclipse mean? 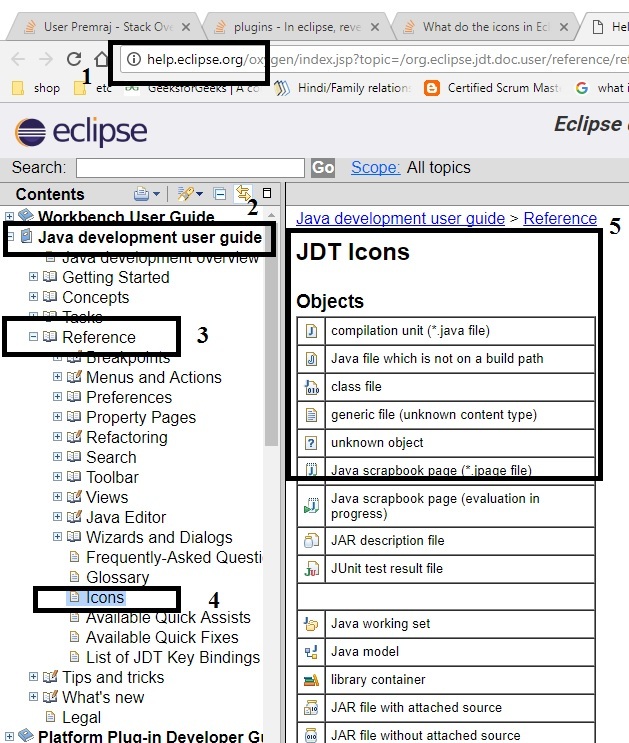 What do the icons in the Eclipse debugger mean? What do the icon decorators in Eclipse mean? 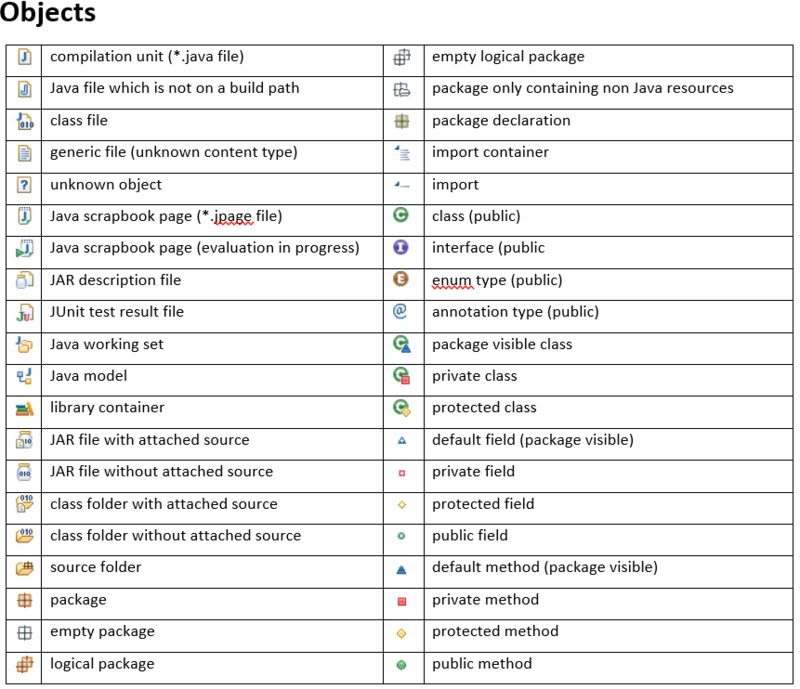 What do the icons in Eclipse's Package Explorer mean? What do the little letters on top of Eclipse icons mean? What's the difference between the two error icons in Eclipse (the x in the red circle and the one with the light bulb)? I just came to SO looking for this, didn't find it, and found it on my own elsewhere. But I thought it would be good for SO to have the answer for future reference; I wondered about them all the time when I was new to Eclipse (this was before I discovered SO). 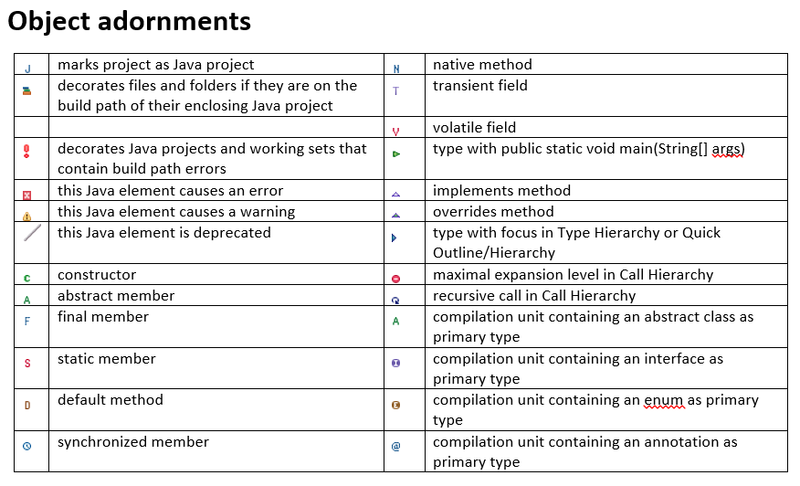 This is a fairly comprehensive list from the Eclipse documentation. If anyone knows of another list — maybe with more details, or just the most common icons — feel free to add it. If you're a Subversion user, the icons you're looking for may actually belong to Subclipse; see this excellent answer for more on those. I can't find a way to create a table with icons in SO, so I am uploading 2 images. Not the answer you're looking for? Browse other questions tagged eclipse icons or ask your own question. What do the icons for methods in Eclipse mean? Eclipse breakpoint blue circle vs glass icon? What does the red exclamation point icon in Eclipse mean? What do the arrow icons in Subclipse mean? What does the brown asterisk icon on a file mean in Eclipse? How to check the icon meaning in the eclipse (project explorer)? What does this icon in Eclipse mean? Where are these Eclipses PyDev icons defined? eclipse build.gradle has a red slash through it, what does that mean?